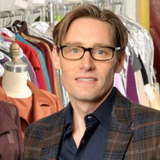 Emmy nominated Daniel Lawson first began by studying costume design at Northwestern University where he received his BS in theater followed by an MFA at Rutgers University. Daniel has assisted on many television shows including Law and Order, One Life to Live. More recently Daniel's work is featured on The Good Wife. He is also known for his work in various movies such as The Bourne Ultimatum, Across the Universe and Revolutionary Road.